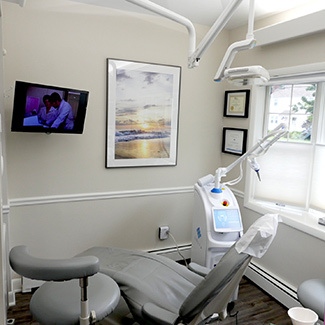 As a full-service provider, Midland Park Family Dentistry offers a broad array of services to address the current and growing needs of our patients. From the simplest of procedures to the most complex, we have the experience, services, and solutions to address them in the least amount of time, and with no pain. We’re proud to offer tailored solutions that address patients’ specific needs. Whether it’s our ability to deliver a crown in one visit without messy impressions and temporaries, or restore a broken tooth or cavity without needles and numbness through the use of laser technology, the most beneficial service I can offer my patients is personalized service and care. Other services include dental implants, bonding and fillings, crowns and bridges, dentures, extractions, and TMJ treatments, as well as a host of other general dental procedures. Complete your crown treatment in a single appointment. CAD/CAM technology means no messy impressions and more accurate results. Efficient rotary endodontic tools enable us to provide gentle treatments in less time. Custom implant crowns, bridges and implant supported dentures can help you smile with confidence. Experience minimally invasive restorations that are performed without any injections! We use transillumination tools to screen for cavities before an X-ray is even necessary. From your annual dental exam to oral appliances and laser periodontal therapy, the future of your smile is in good hands. Enhance your smile’s beauty with our custom teeth whitening, veneer treatments and porcelain crowns and bridges. Find out how Dr. Tony can help you enjoy a confident, healthy smile in just one trip to our office. Contact us today to book your first visit. We’re open late on Tuesday and have Saturday hours. Dr. Caramico has been my dentist for the last two years, him and his staff are very kind. I’ve had extensive dental work done here and it’s been a relaxing experience every time.